Mother Joseph of the Sacred Heart (1823-1902) is credited with works built in the present states of Washington, Idaho, Montana, Oregon, and British Columbia. Born Esther Pariseau in Saint-Elzéar, Québec, the “Mother with a hammer” was honored by the State of Washington as one of two people to represent it in the National Statuary Hall Collection in Washington, D.C.
Louise Blanchard Bethune (1856-1913) designed and built works in the Buffalo, New York area, including the Lafayette Hotel, which was one of the eleven most luxurious hotels in the United States when it opened in 1904. Mother Joseph’s and Louise Bethune’s signature buildings, Providence Academy, Vancouver, Washington, and the Lafayette Hotel, Buffalo, New York, are both listed on the United States’ National Register of Historic Places. Both buildings are cases of historic preservation and adaptive reuse. 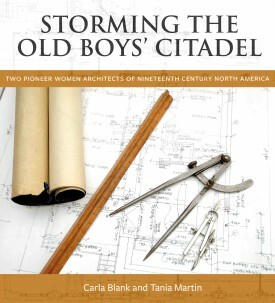 Carla Blank and Tania Martin breathe new life into the lives and works of these two remarkable nineteenth-century women. Carla Blank is the author of Live On Stage! and Rediscovering America: The Making of Multicultural America, 1900–2000. Her articles have appeared in El Pais, The San Francisco Chronicle, The Wall Street Journal, Green Magazine, Hungry Mind Review,Counterpunch, and Konch. She lives in Oakland, California. Tania Martin is a professor at the Université Laval School of Architecture in Québec City where she has held the Canada Research Chair in Built Religious Heritage since 2005. She has published essays in scholarly journals on architectural history and North American religious institutional structures. She lives in Québec City.